A mystery whistleblower who is blogging under the name Kingston University London Dissenter is exposing corruption within Higher Education institutes, and he or she wants everyone to know about it. According to the blog, the University and College Union (UCU) have recently polled Kingston University as the second worst university for bullying. 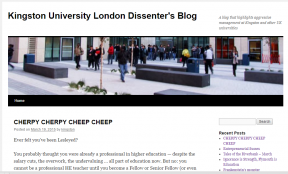 The Kingston University London Dissenter’s Blog describes itself as “A blog that highlights aggressive management at Kingston and other UK universities”, but is shrouded in mystery as to who this Kingston whistleblower really is. The cogent blog exposes some harsh truths of the current working conditions for Higher Education staff and teachers, reiterating the perception of the UK as an over-educated, over-worked and underpaid country. As well as Weinberg being referred to as ‘ratty’, mock posts include bogus messages from Edith Sim (jokingly titled ‘C Nesbitt’ in the blog) the former Dean of Science, Engineering and Computing and Lesley-Jane Eales-Reynolds Deputy Vice Chancellor of Education. There is no illusion about vice chancellors’ paypackets; the reality of their wages being astronomical, especially in comparison to the ever-decreasing benefits of university teachers. The unidentified blogger explains that staff at Plymouth University have taken a 30 per cent pay cut of late, as well as them having to pay for their parking unless they are on a zero-hour contract; which is also a work condition that many Kingston lecturers are now under. A particularly harrowing consequence of the commodification of universities in todays climate is emphasised in Loss of a colleague. Posted on 6 October 2014, the writer explained that a support technician for Kingston University died of a heart attack. Only in his early fifties, he was under a lot of stress at the university as well as worrying about the job re-application process. There was an even more disturbing case at Imperial College London which can be read here. The mere fact that a Higher Education professional feels the need to expose these truths shows the real need for a change in the university, whether that be the internal renunciation of an oppressive hierarchy, or a bigger, more societal change in the financing of universities. March 22, 2015 in Homepage. “It’s not just about economics, it’s about the community.” Is a local currency really the answer to the ever-declining high street? ← “It’s not just about economics, it’s about the community.” Is a local currency really the answer to the ever-declining high street?